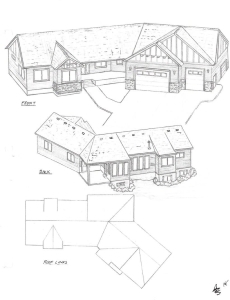 What sets me apart from other Spokane house plan drafting companies is hands-on experience. I have framed hundreds of houses in all kinds of weather. 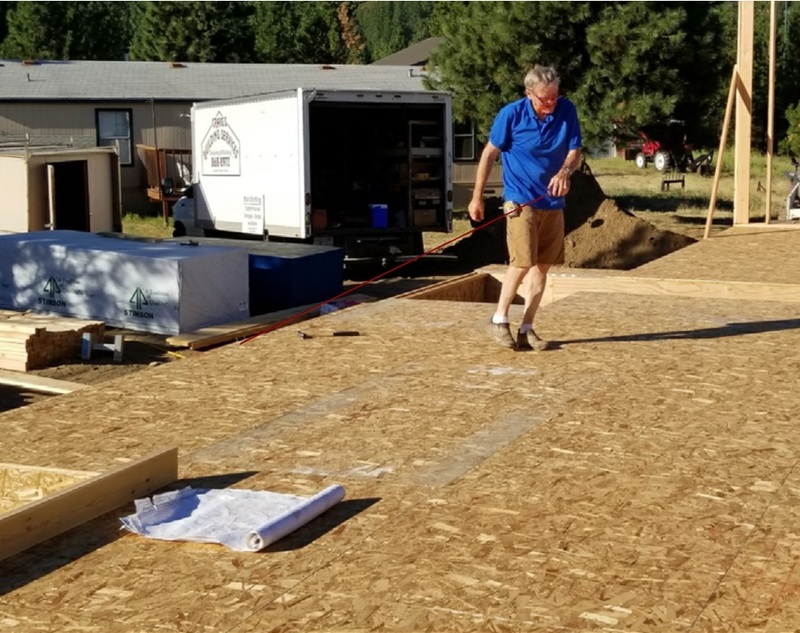 My crews have built as many as 85 houses in one year doing all the framing, painting, cement flatwork, cabinet installation, deck building, and finish carpentry under my tutelage and supervision. As a young boy, I went to work on my father’s foundation crew. Later I went to work for my mother when she began building homes in 1972. Through the years I learned all phases of carpentry and became a home builder myself. Eventually, I learned to draft house plans in Spokane. Each year my wife and I build a few custom homes or major remodel projects, preferably one at a time. When the stars align for me, I divide my time working with my crew in the morning and drafting in my office in the afternoon. 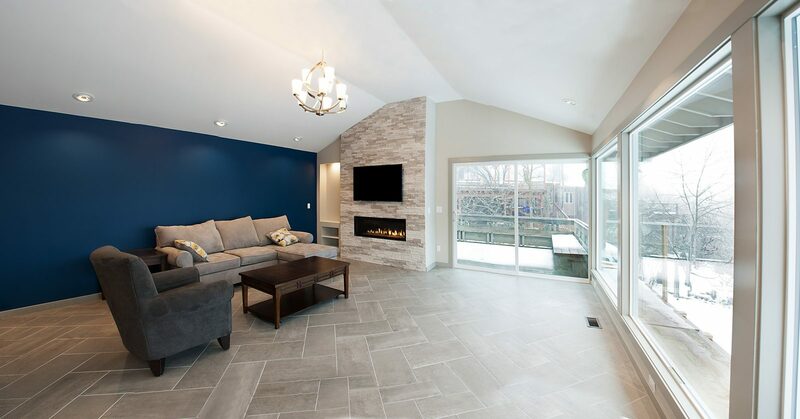 All this experience makes me a resource of information on all aspects of your upcoming project and I can provide my list of suppliers and sub-contractors that I have used for years. Like my mom, who is now in her 80’s and still building homes in Spokane, I will be around long after your plans are completed, available to answer any questions you might have during the course of your building project. 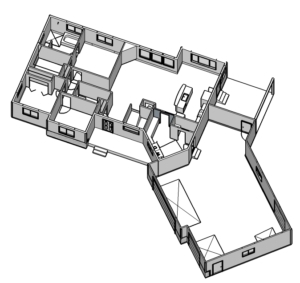 I have been drafting Spokane house plans for several years. Actually, I do much more than just draft house plans for houses to be built in Spokane. 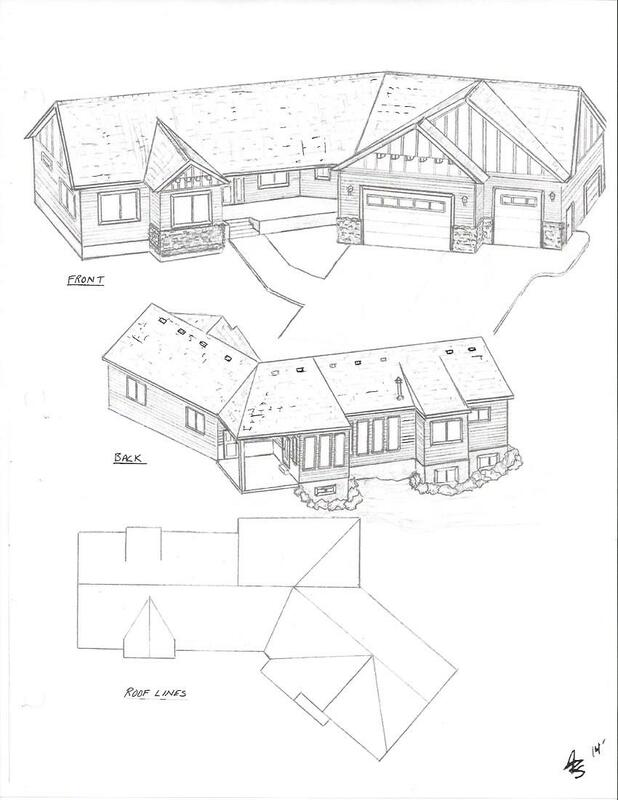 If you have a project in mind, any building project, then you need a set of plans whether it be custom home plans, addition plans, shop plans, tool shed plans or deck plans. I draft plans for all these, and they are all that you need to get estimates, permits and the thing built. And you do not have to live or plan to build in Spokane given our wonderful worldwide web which has enabled me to work with clients living in other parts of the country whom I never had the privilege to meet in person. 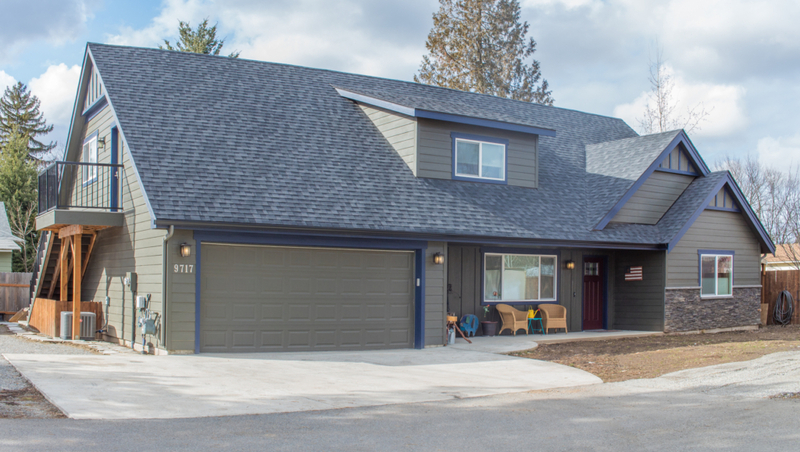 Rob and Amy Stone had found a lot at Shelly Lake in the Spokane Valley that they wanted to build a custom home on. After scouring the internet, they found a few plans that were close but not quite all that they were looking for and so Rob found me to help them out. Obviously Rob is talented and he is involved in residential construction and so he came up with some great sketches. In addition to this rendering he provided me with a floor plan that was based on something he had found on the internet. I took these and began building a 3-d model in sketchup. Sending him several videos along the way to get his feedback. Like most of my clients, Rob was surprised by how many decisions he had to make during the designing phase of the house plan drafting process. By showing him the 3d model I was building through videos that I make of my screen while I am talking and explaining, he was able to visualize what I was discussing and then give me the feedback I needed to move forward and create exactly what they had in mind. phase of construction and will soon be ready for move-in. Craig designed my home from a sketched out drawing I gave him. His understanding of the building process and great visualization of what I was requesting transformed my dreams into our wonderful home. His video presentation in 3D really helps to walk you through your home and get a feel for the rooms. I would recommend Craig to anyone building a home, Why pay $ for a pre-designed plan when for nearly the same price you can build what you want? Laura and I really enjoyed working with you on the design of our home. You kept us involved in the process so when it was completed it was exactly as we wanted. Your communication and f0llow through was so appreciated. We would recommend you and your process highly. Thanks for completing it on time and on the budget we agreed on. 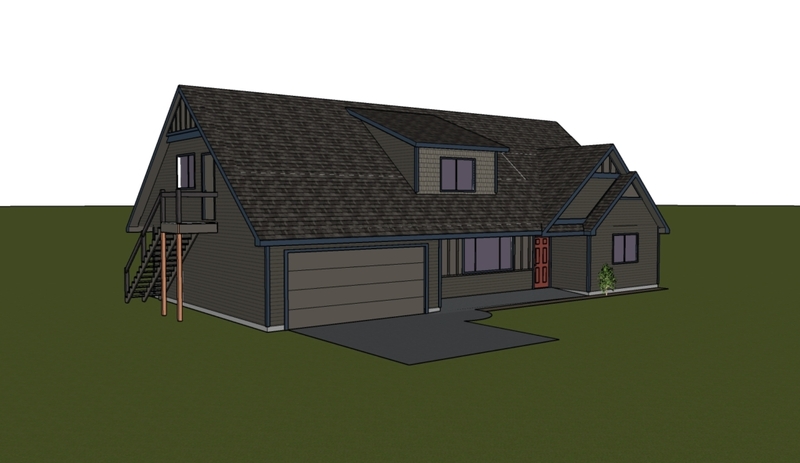 and other Spokane house plans I have designed and built. Currently I am building a home that has never been built in our area. 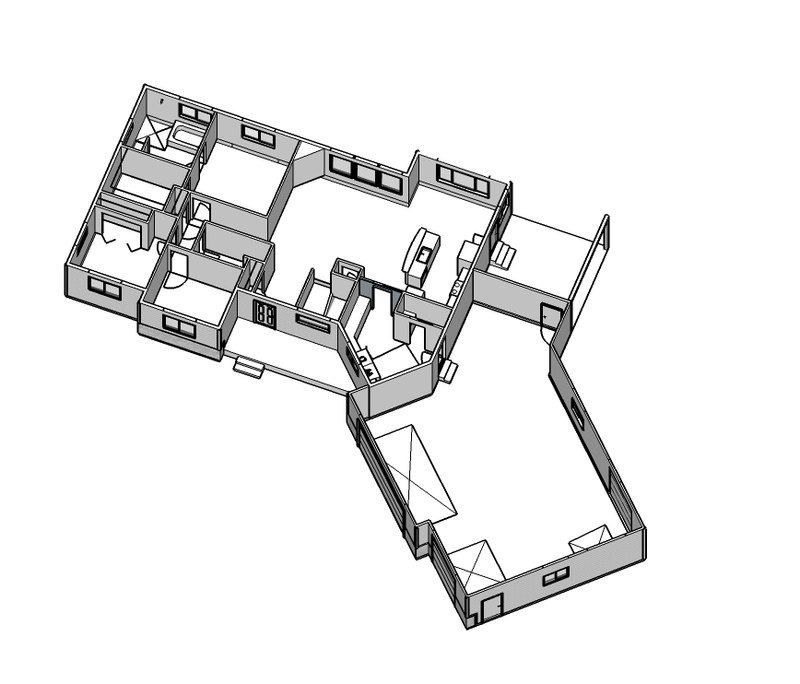 It is an ADU house plan design that I came up with that I thought needed to be built in the real world, in today’s world. No one is building it anywhere much as far as I know but I believe it it something that addresses a growing niche in America. Learn what an ADU is and why I believe it is far past being a need for the present and certain to be a fixture of the future. Click on picture to left. 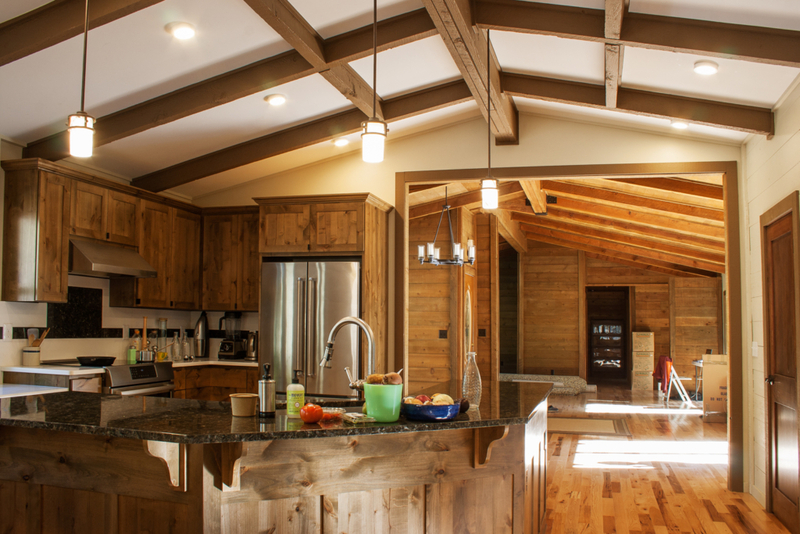 I have an extensive photo portfolio on my Houzz site featuring many spokane house plans, addition plans as well as remodel projects.